Below you find an overview of the example scenario for this blog post with the 3 flows mentioned – I highlighted the manual and automated tasks in blue/red respectively and painted processes and interfaces as solid lines/dotted lines respectively. It requires to receive an acknowledgement if sales order creation in AX was successful or not. It requires to receive stock updates at least every 5 minutes. It requires to receive information that the picking process for the items has started. This information is then available in the customer’s ‘My account’ section on the online store and is sent to the customer by SMS. 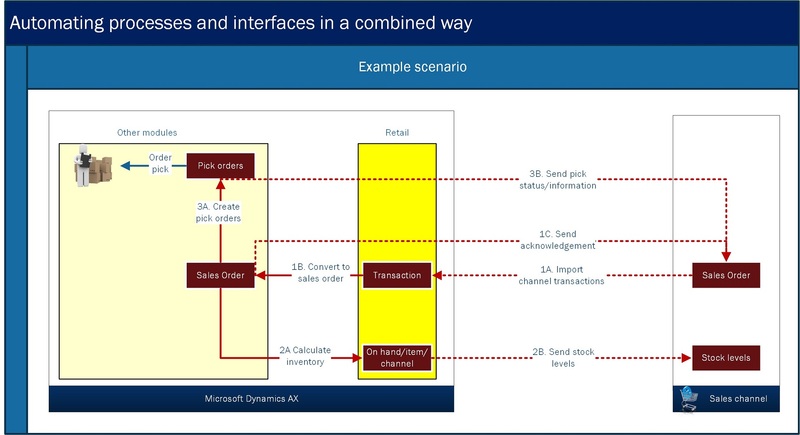 The interface flows 1A, 1C, 2B and 3B can be supported by Retail Distribution Schedules (Retail > Periodic > Data distribution > Distribution schedule), although they might have to be custom configured. The distribution schedules are to be configured as batch jobs. The transaction to sales order conversion can be supported by the Synchronize online orders batch job for E-commerce (Retail > Periodic > Synchronize online orders) or the Post statement batch job (Retail > Periodic > POS posting > Post statement) for POS. In this case we work with the Synchronize online orders batch job as in the example scenario we have to pick order placed at the online store. Creating pick orders can be automated in multiple ways but in this case we leverage the Picking workbench (Inventory management > Periodic > Picking workbench > Picking workbench). Important to notice here on the side is that both the Synchronize online orders batch job as well as the Picking workbench will try to reserve items automatically, independent from the settings in the Accounts Receivable parameters (> General > Sales > Reservation) which might be on Manual. For this reason, and for the reason that picking will be tied to one specific point of time (for example 7AM), as opposed to the other batch tasks which will run periodically throughout the day, the 3 different ‘flows’ (combinations of business event and interface) are to be scheduled in their own frequency. 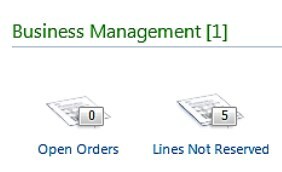 This also provides the opportunity for an order manager to allocate additional on hand stock to fulfill open order requirements which failed to claim stock at import before the picking workbench runs automatically. So… from helicopter perspective AX has a pretty good coverage, right? But we need to bundle the automated tasks in 3 groups which can be scheduled in their own frequency, instead of having to manage 7 batch jobs which are to be aligned in timing individually. How do we organize that? Multiple batch tasks per batch job, to be run sequentially. Custom distribution schedules to support our interface flows, to be run as batch tasks. Assumption: we leverage standard AX/Retail CDX for interfacing, so we ship data in/out through the AX channel database for the sales channel. Through extending the RunBaseBatch framework: the ‘classical’ framework. Through extending the SysOperation framework: the framework introduced with AX 2012 which is recommended by Microsoft. Note: if this method is not added or returns FALSE, the batch class is simply not selectable as batch task under a batch job. 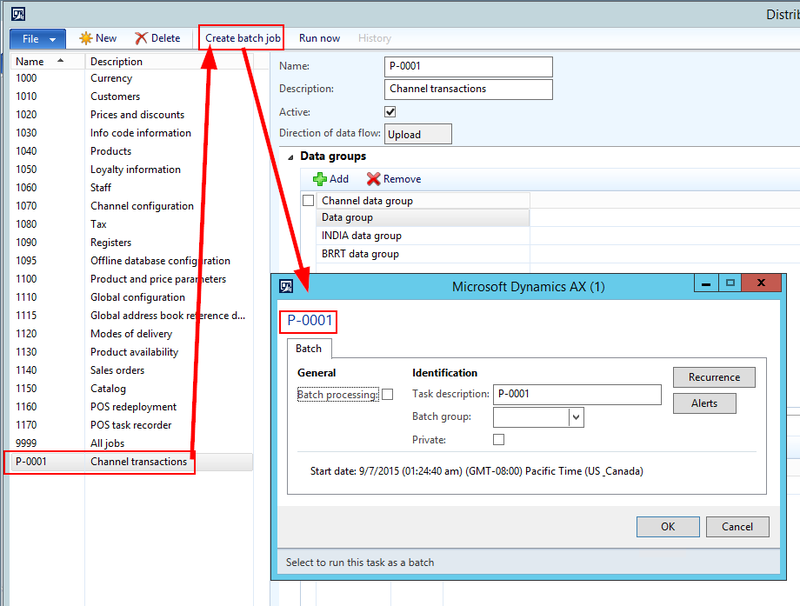 Note 2: you may have noticed that for some Retail batch jobs, Microsoft has added the CanGoBatchJournal method in AX 2012 R3. Customization part 2: passing parameters to the batch task. 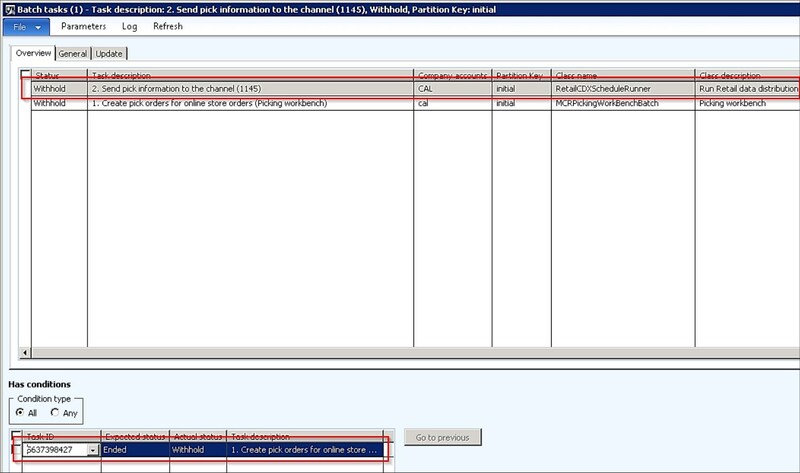 As a batch class is sometimes built upon an existing form which is designed to pass parameters to the batch class (in the example above: a parameter which indicates which distribution schedule to run), it is not always possible to set the right parameters in the context of the batch job configuration form. 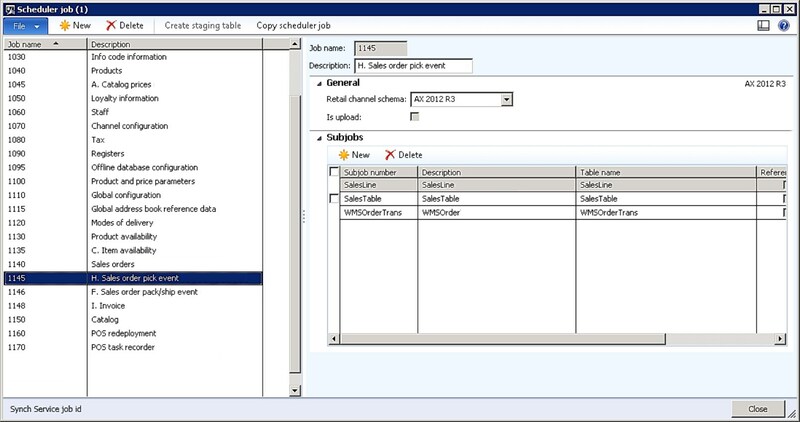 See below for an example of this issue: the Distribution schedule form (Retail > Periodic > Data distribution > Distribution schedule) passes the selected distribution schedule as a parameter to the batch form when configuring a batch job. In the Batch tasks form (System administration > Inquiries > Batch jobs > View tasks; see figure below), this parameter cannot be set (only consulted). So in areas where the batch class parameterization relies on existing forms, some controls and business logic have to be added to enable the batch class to receive the right parameter values. Server configuration. When applying batch task conditions you’ll notice that some batch tasks (for example a Retail Distribution schedule) create subtasks which cannot be conditioned. So if Task 1 creates a subtask 1a, then task 2 could already start running in a separate (parallel) thread. 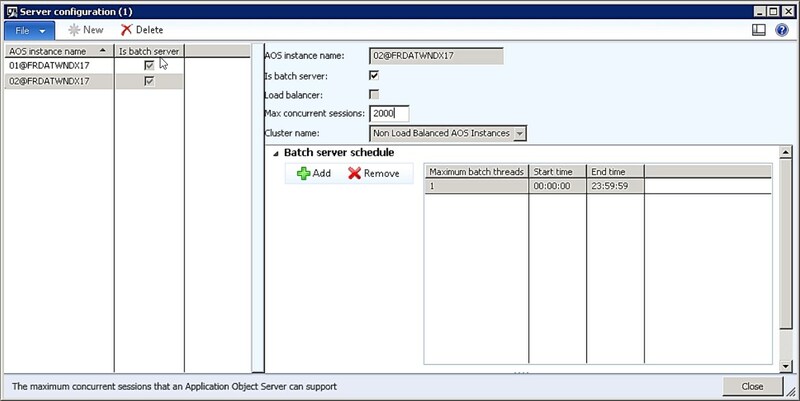 Therefore, to force AX to run the main tasks sequentially, the number of threads on the batch Server configuration (System administration > Setup > System > Server configuration should be put down to 1 – Note that Maximum batch threads indicates the number of tasks AX can potentially execute in parallel per batch job. I hope this has given you an impression on how you can create sets of interrelated automated tasks, whether having a business or integration background, to simplify the management of your complete solution and maximize comfort for your business and IT users. Happy DAX’ing and happy holidays!